If you can answer a resounding “YES!” to two of these, and a “. . .uhhh . . . I don’t know about that . . .” to a third – then the Albuquerque Balloon Fiesta might be just the thing for you. Albuquerque plays host to hundreds of hot air balloons from all over the world every year during early October. The festival is so popular, world-wide, that organizers had to begin limiting the entries each year. In 2000, over 1,000 balloons were registered for the festival. At that point, the organizers decided to go with a “quality over quantity” approach. In addition, development all over the Albuquerque area was reducing the number of landing areas near the balloon park. The following year, a limit of 750 balloons was set, and this was lowered to 600 in 2009. 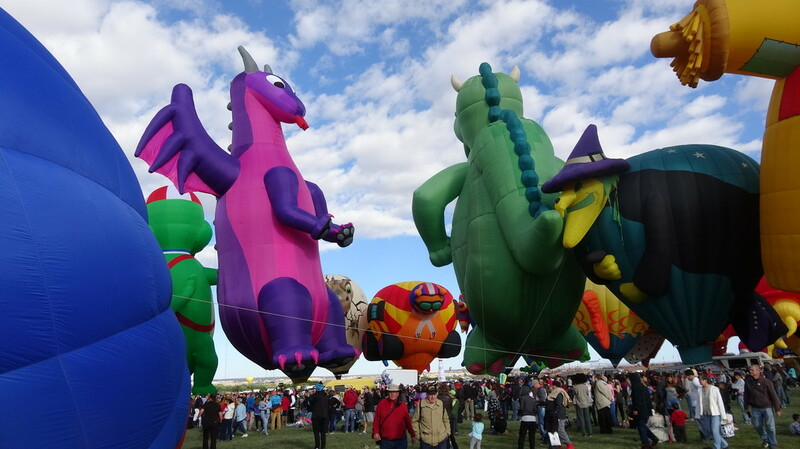 For the 2016 Fiesta, there were about 550 balloons registered to participate. 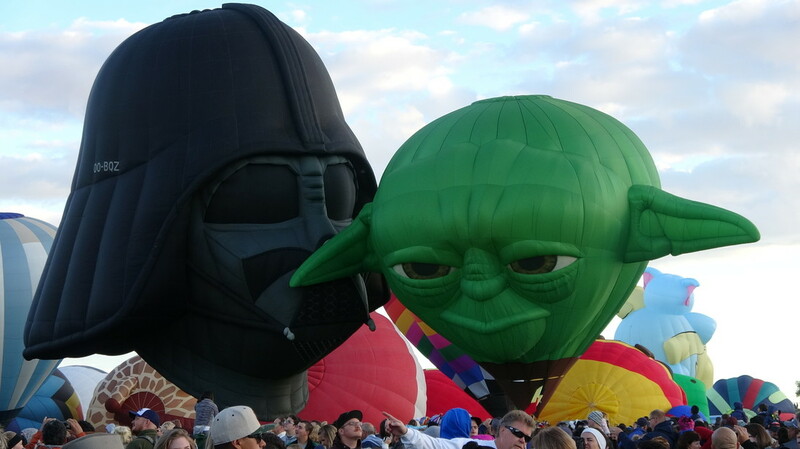 It is still the largest, most prestigious balloon event in the world. The Fiesta public parking areas open each day at 4:30 AM, and the festival grounds soon after that. Buses from around the Albuquerque area begin pouring in, emptying their riders to enter the Fiesta site. Hundreds of RVs occupy lots immediately adjacent to the Balloon Fiesta Park, and their occupants either stroll to the launch area, or just drag out chairs from their RVs and sit down to watch. 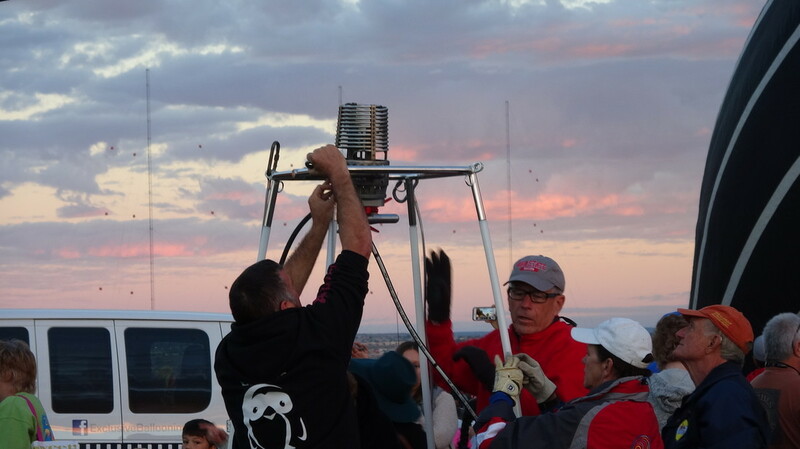 First to launch each day is the Dawn Patrol: A dozen or so balloons that launch into the pre-dawn sky, and report back via radio what the wind conditions are at varying altitudes. With the information reported by the Dawn Patrol, the race officials begin to make launching decisions for that day’s activities. The launch area at the Balloon Fiesta Park is gargantuan – over 50 football fields would fit in the launch field. It is divided into a grid that will allow over 200 balloons to be set up at one time. Actual launching times are staggered to prevent collisions, but on the Mass Ascension days, the sky is filled with balloons of all shapes and sizes. As soon as one crew launches its balloon, another crew is waiting to set up and get ready to launch theirs. 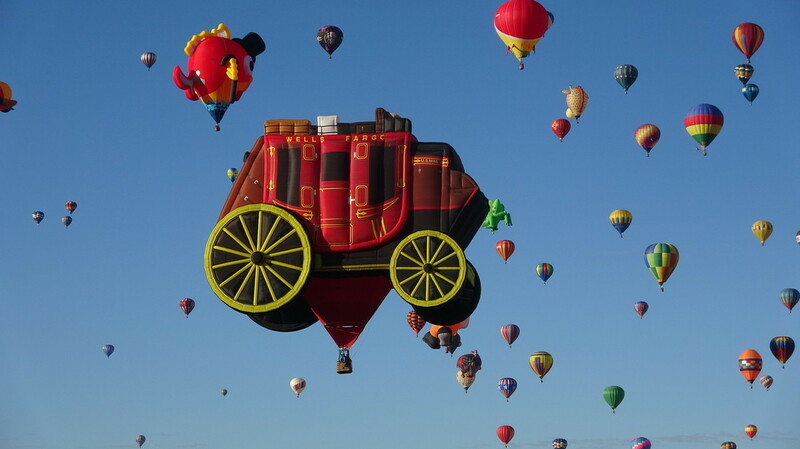 A condition called “box winds” during each October in the Albuquerque area makes this festival highly popular for balloonists. Hot air balloons are essentially un-steerable, and simply drift the direction of prevailing winds. Winds out of the north near ground level make the balloons drift to the south just after liftoff. Higher elevation winds blow from south to north, so as the balloon rises higher, it will drift back to the north. A highly skilled balloonist can launch, drift south, drift north, and end up landing where the launch occurred. Hot air ballooning as we know it is a relatively new pastime. Although the first manned hot air balloon flight occurred in 1783, the inherent lack of control made the whole concept unappealing for almost two centuries. Gas balloon technology, though, had much more appeal for commercial, military, or publicity uses. Gas balloons use a lighter-than-air, unheated gas to provide lift. Initially, hydrogen was used, but its inherent hazards pushed the much more expensive helium in as the gas of choice. In 1960, Ed Yost developed a controllable burner that made modern hot air ballooning possible. The modern hot air balloon pilot has two controls: He can pour heat into the balloon chamber (called the “envelope”) to make the craft rise. The pilot can also open a port at the top of the envelope to let hot air escape, and the balloon descends. In addition, if the pilot does neither, the hot air in the envelope will cool and the balloon will slowly descend. Safely managing the hundreds of balloons , along with over 100,000 spectators on site, requires a degree of preparation and organization that is awesome to behold. One launch controller directs dozens of launch directors, which are called “zebras”. 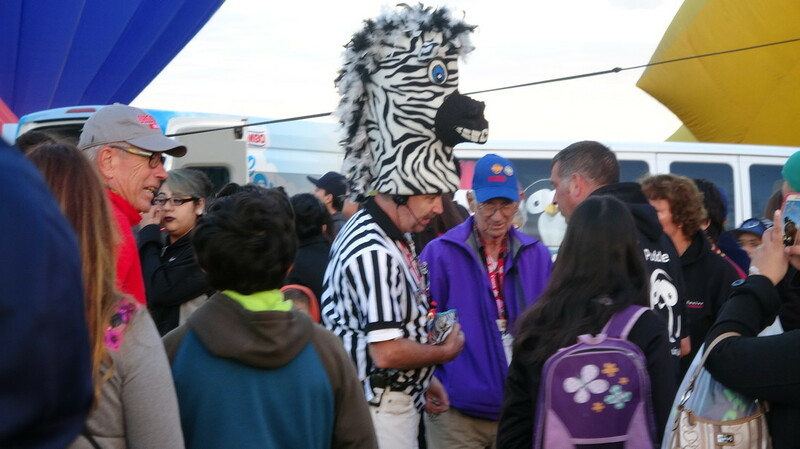 The controller and his band of zebras are the ultimate authority on who launches where and when. If conditions are not optimal, they can delay (or cancel) launching. “Wanting to see a hot air balloon, you are?” when that one launches. 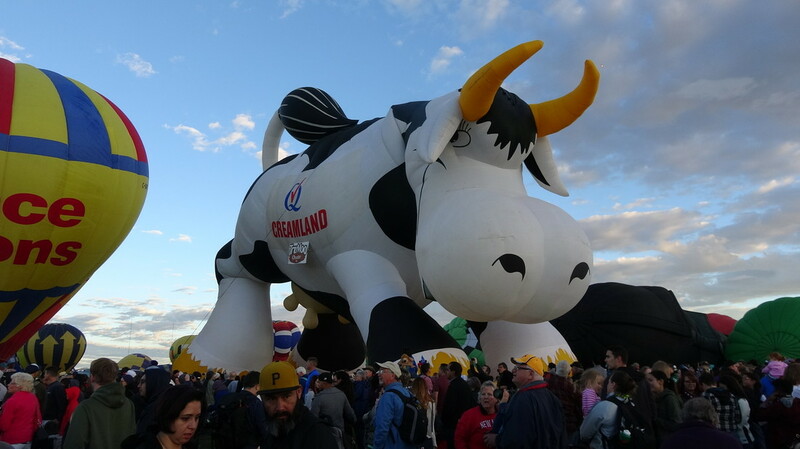 Some of the Special Shapes reflect the sponsors: Wells Fargo had a balloon shaped like an old west stagecoach; a dairy co-op had a gigantic frisky hot air Holstein with an udder the size of a small school bus. An obstetrician brought one that was shaped like a stork (with baby in a bundle) crashing through a balloon. There were hot air dogs, fireplugs, fire engines, fish, astronauts, frogs, bears, bugs, and some that we just said, “What the . . .?”. 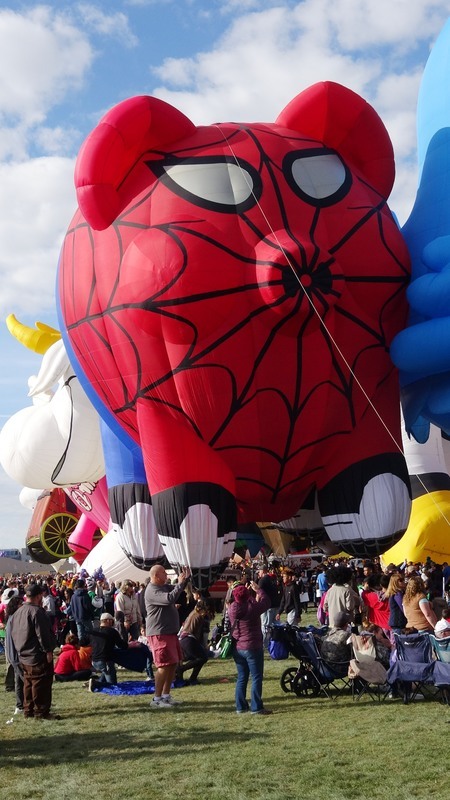 My favorite was Hamlet, the flying pig – until I saw Spider Pig set up and flying. Besides the Mass Ascensions and the Special Shapes, the balloons also can provide a special treat when they are not flying. A “Glow” is produced when the burner for a balloon is turned on while the balloon is set up in darkness. The “lantern” effect is absolutely beautiful. The pilots will have a glow in the pre-dawn morning before a takeoff, or in the evening – purely for the effect. The balloons may launch before the sunrise, but they do not typically launch in the evening. Balloon pilots always appreciate a challenge to test their piloting abilities. The Fiesta hosts several types of flying competitions: In one type, the balloon is launched miles away from the Fiesta, and the pilot attempts to score in a sort of “ring toss” on a pole from aloft. In another competition, a pilot tries to land a bean bag in the center of a target area, once again, after launching from miles away. Prizes can range from gift certificates to a new car. The Fiesta also invites the pilots of lighter-than-air gas balloons to compete in their own events. While we were at the Fiesta, a group of gas balloons launched in a race to the East Coast. Since a gas balloon can no more be steered than a hot air balloon, the East Coast was the intended direction, but the actual race was for distance traveled in an elapsed time. The winner in 2016 traveled over 850 miles in about 55 hours of flying time, and landed in northeastern Missouri. The runner-up landed in south Texas. Due to the extreme elevations that they can attain, gas balloons are usually equipped with pressurized passenger compartments. 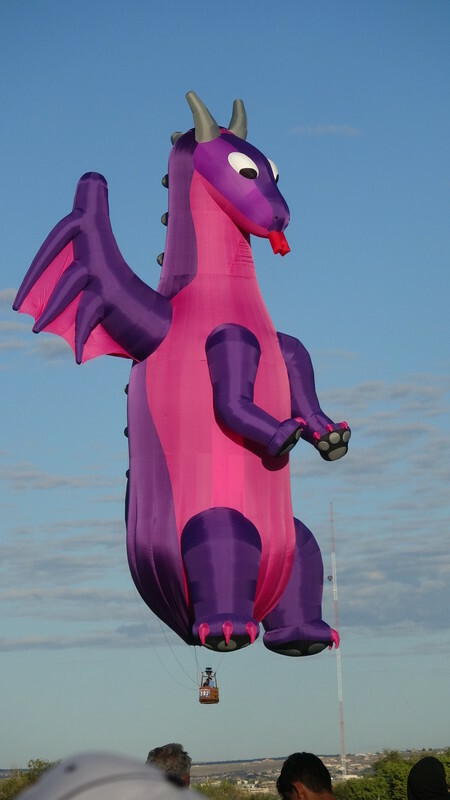 This allows them to fly much higher than the altitudes hot air balloons can safely achieve. As you might guess, gas ballooning is considerably more expensive than hot air ballooning. A simple hot air balloon can be bought for about $20,000; just filling a gas balloon with helium can cost between $5,000 and $10,000, for one flight. The envelope of the balloon can be filled with either helium (very safe, good lifting capabilities, extremely expensive), hydrogen (highly explosive and flammable, outstanding lift, relatively inexpensive), or ammonia (toxic and dangerous, very poor lifting, but very inexpensive). Hot air balloons usually have open baskets that can hold from one to 16 passengers; the pressurized passenger compartment on a gas balloon typically has room for only one or two passengers. 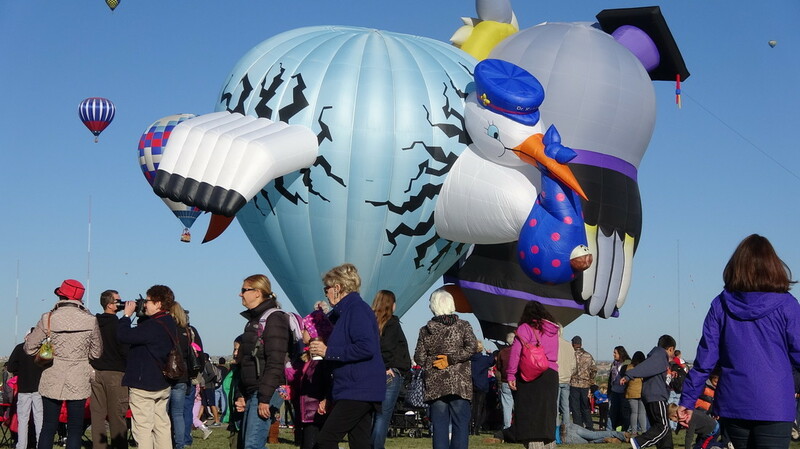 There were less than ten gas balloons registered for the Fiesta in 2016, versus about 550 hot air balloons. 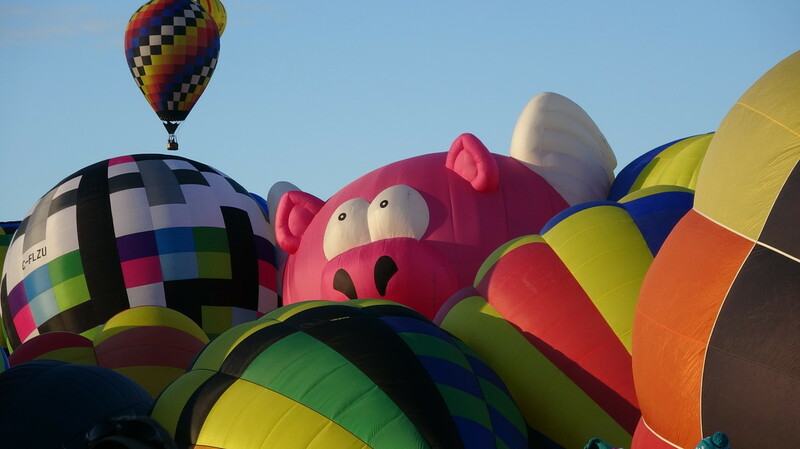 If a week and a half of solid ballooning is a little overwhelming, visitors can take breaks and soak up the other sights and activities in the Albuquerque area. Old Town is a charming, unique shopping area with stores and restaurants. For fans of the “Breaking Bad” TV series, tours start at Old Town and visit filming locations used in the series, traveling around in an RV just like the one used in the show. The Sandia Peak area has hiking trails and a tramway going to the 10,378-foot summit of Sandia Peak. Other areas feature historic ruins, casinos, and general sightseeing. The nearby Kasha-Katuwe Tent Rocks National Monument has all sorts of strange natural rock formations. Get accommodations early, very early. By spring before the festival, most desirable sites are already full. As far as eating goes during a day at the Fiesta, breakfast, lunch and dinner are all served by vendors there. Food is pretty typical festival-food. Sausages, fried you-name-it, funnel cakes and the like prevail; healthy eating is possible, but you have to search for it. For those that have to have the Ultimate Fiesta Experience, you can sign up for your own lift-off in the early morning of the festival. Reservations may be hard to get, and be prepared for a $500 ticket -- but for some, it's not a complete Fiesta unless they're airborne. The passengers I talked to had all made their reservations weeks – or months – before the Fiesta. To all of them, a flight while you were at the Fiesta was necessary to make their Albuquerque experience complete. I asked one of the employees at Rainbow Ryders Balloons if all their passenger flights were completely full, he replied that a few scattered openings might be available over the next several days, but he couldn’t guarantee anything firm. The passenger flights all take off with a dozen or more passengers in a large wicker basket.